A Near-Earth Object Survey spacecraft planned by Ball Aerospace & Technologies Corporation. Placed in a Venus-like orbit, its mission would be to on the prowl for space rocks near Earth. NASA needsan asteroid-hunting spacecraft to finally get serious about thepotentialthreat of nearby space rocks that could slam into Earth, experts say.Lately,support is building to finally develop such a mission for both safetyandscientific reasons. An asteroidhunter might take the form of an infrared imaging telescope placed in aVenus-like orbit around the sun. This high-tech spotter scope couldview a muchlarger portion of the sky for possible asteroidthreats than could observatories from the Earth. Such a missioncould also provide a rapid means of compiling an inventory of viableNear-EarthObject (NEO) targets for potential human exploration ? now on NASA'sto-do listas called for by President Barack Obama. Moreover, adedicated NEO-studying spacecraft could help humanity finally come upwith aplan for how to thwart ominousNEOs on track to smack our fragile world. NASA alreadyhas a congressional mandate to catalogue nearby space rocks. Named afterthe late congressman, the George E. Brown, Jr., Near-Earth ObjectSurveysection of the 2005 NASA Authorization Act called upon the space agencyto detect,track, catalogue and characterize the physical characteristics of atleast 90percent of potentially hazardous NEOs larger than roughly 460 feet (140meters)in diameter by the end of the year 2020. Butblue-ribbon panels of experts looking into the matter for the NationalResearchCouncil reported in back-to-back reports in 2009 and 2010 that a lackof cashand political muscle make it "infeasible" that such a NEO census canbe accomplished by 2020. "If weseriously want to find all the asteroids which could be an impacthazard to theEarth, as well as find the asteroids which would be good destinationsfor humanspaceflight, then a space-based survey telescope in solar orbitinterior toEarth's would be the most rapid way to do that," NASA's Lindley Johnsontold SPACE.com. Johnson is the space agency's NEO Observations ProgramExecutive in the planetary science division of NASA's Science MissionDirectorate in Washington, D.C.
LastOctober, the final report of the Ad-Hoc Task Force on Planetary Defenseof theNASA Advisory Council (NAC) was released. It reported,among a number of findings, that to achieve NASA's NEO search goals ina timelymanner as directed by the George E. Brown NEO Survey legislation, thenationwill likely need a new space probe in addition to ground-basedsystems. "Aspacecraft operating with sensors in the infrared band from an orbitsunward ofEarth's (such as a Venus-like orbit) offers great advantages in rapidsearchand repeat observation frequency," the NAC task force wrote.Essentially,the observatory would be able to monitor space rocks over time todeterminetheir hazard potential. One conceptthat has already been fleshed out is dubbed the NEO Survey mission, adetailedappraisal done by Ball Aerospace & Technologies Corporation inBoulder, Colo.
As explainedin a Ball Aerospace white paper review provided to SPACE.com, in only1.6 years,a spacecraft could locate all of the roughly 165 feet (50 meter)diameter, andlarger, nearby space rocks that are potentially accessible for humanspaceflight, and within 7.5 years could catalogue 90 percent of allNEOsgreater than 459 feet (140 meters) in diameter. "Wehave more work to do, but what we've created is a very high-qualityexistenceproof. We have a point design based on real engineering with realparts,"said Robert Arentz, a Ball Aerospace Advanced Systems Manager. Arentz toldSPACE.com that the NEO survey spacecraft draws upon the firm's heritageofworking on NASA's space-based observatories ? from the Hubble SpaceTelescopeand the Kepler exo-planet hunter to the Spitzer infrared telescope andtheWide-field Infrared Survey Explorer, along with the company'scomet-smackingDeep Impact spacecraft. The internallyfunded Ball Aerospace concept has not yet been given a green light byNASA,noted Kevin Miller, a Ball Advanced Systems Manager, but the pointdesign doesshowcase proven capabilities and an affordable approach, he said. Thework usesa recipe "to establish confidence that, yes, this really is a verytractable problem," Miller said. In order tomeet the George E. Brown requirements to find 90 percent of all NEOslargerthan some 460 feet (140 meters) within 7 years, the NEO Survey missionwouldcost roughly $638 million. The catalog it would yield is a superset ofthe targetsthat NASA human spaceflight planners would find of interest for pilotedexcursionsto selected space rocks. Given a go, theNEO hunter from start to launch should take around 42 months todevelop, Arentzadded. But there aretechnological challenges in building the NEO survey spacecraft. Dealing withsolar radiation is one. The heat load from a location so near the sunmeans thespacecraft would need a large thermal shield and cryocooler hardware.Also, thetelescope's photon-gathering array requires highly advanced engineering. The key is toprevent the intense solar radiation at Venus from reaching thetelescope. This isdone by careful design of the spacecraft's solar array and use of twothermal shieldsbetween the main array and the telescope. 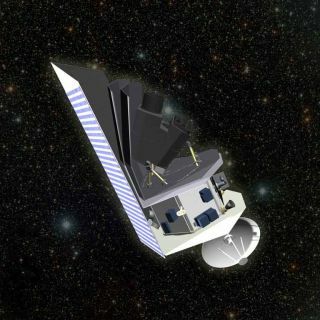 The spacecraftdesign, Arentz said, is based largely on the Kepler planet-huntingspacecraft designto reduce cost and risk. And, if twoNEO-huntingspacecraft were placed in roughlyopposite locales ina Venus-like orbit, this would allow a binocular view ofspace rocks, andscientists could chart them with an even greater degree of trackingaccuracy. Needless to say,space-based searches for NEOs come with technical challenges. Butfinding the fundingfor the concept within an already over-subscribed NASA presents anotherchallengealtogether. "There'salso a compelling need to generate momentum and show some positiveprogress towardsthis general class of mission in the near-term," Miller said. Scientists saythere would be a significant payoff, eventually. By the end ofthe proposed spacecraft's lifetime ? in the range of seven to eightyears afterlaunch ? the NEO catalog would contain somewhere between half a millionand a millionnew objects. Beyond feedingthe scientific community a wealth of new information, the telescopiccapabilityalso supports NASA's desire to fly both robotic and human expeditionsto selectasteroids. Furthermore, the spacecraft would enable a planetary defenseresponseif any Earth-threatening NEOs are found, proponents say. "It's amoral imperative," Arentz said, whether there's no planetary defenseproblemat all or our planet has a problem child headed ourway. "So it'sexactly like cancer. The sooner you know, the better it is. You eitherknow you'resafe or you've got the necessary lead time to fix it," Arentz added. Former astronautRusty Schweickart, who served as co-chair of the NASA Advisory CouncilAd-Hoc TaskForce on Planetary Defense told SPACE.com: "If perfect tracking werepossibleusing [ground-based] telescopes we'd never have to launch a mission toverify whetheror not a NEO were going to impact ? we'd know and launch only if wewere definitelygoing to be hit." Schweickart saidthat with current, and even future ground-based telescope tracking,missions wouldhave to be launched from time to time to rendezvous with a threateningNEO to verifywhether or not the NEO was in fact headed for a bruising impact withEarth. This would benecessary, he said, both due to the limits inherent in any telescopicimage andto the intermittent nature of tracking, which comes with long datadrop-outs. "With atelescope in a Venus-like orbit, the episodic tracking component of thetrackingchallenge will all but disappear, the result of which will be areduction in theneed for transponder rendezvous missions," Schweickart said. The potentialcost benefit of improving tracking by deploying a telescope in aVenus-like orbit,and thereby eliminating transponder missions, can only be determined bydoing arigorous analysis, Schweickart said ? a step recommended by the NACtask force. This logic,whilecritical to planetary defense and cost-saving, only comes into playwhen one goesbeyond finding NEOs into deflecting them, Schweickart suggested.Indeed, a recentWhite House policy letter for the first time assigns NASAresponsibility beyondsimply finding, characterizing and cataloging NEOs. "The interestingthing is that a telescope in a Venus-like orbit contributes to so manydifferentinterests? discovery, tracking and building up the catalog forexploration. Butplanetarydefense is the primary rationale for its deployment,"Schweickart concluded. Leonard Davidhas been reporting on the space industry for more than five decades. Heis pasteditor-in-chief of the National Space Society's Ad Astra and SpaceWorld magazinesand has written for SPACE.com since 1999.